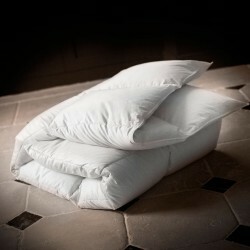 Our temperate natural comforters are designed for intermediate seasons, or for people who are not too hot or too cold. Temperate Comforters offer optimal warmth and a cozy and soft welcome. Garnished with new goose down (Imperial temperate collection) or new duck (Royal Temperate collection) known for their thermoregulating properties, they will also be ideal for rooms heated between 18 and 20 ° C. Our mid-season comforter can be tailor made with personalized embroidery on request. The deadline for completion of the special dimensions is 10 days. All special sizes and customizations are not taken back or exchanged.